I look forward to seeing more pictures. I also appreciated the explanation of 缘分. One of the best things about learning a foreign language is finding out about words that other cultures use that explain concepts that don’t translate directly into English, but are so perfect for the situation! ^ – ^ can find each other and become friends among this world (人海) means we have yuen (缘) already ,fen (海) is something even much harder to have and hold, we will never know until the end of that relationship! Hope that all of your relationships in life is “有缘有海” 🙂 Happy blogging and have a sweet day then! 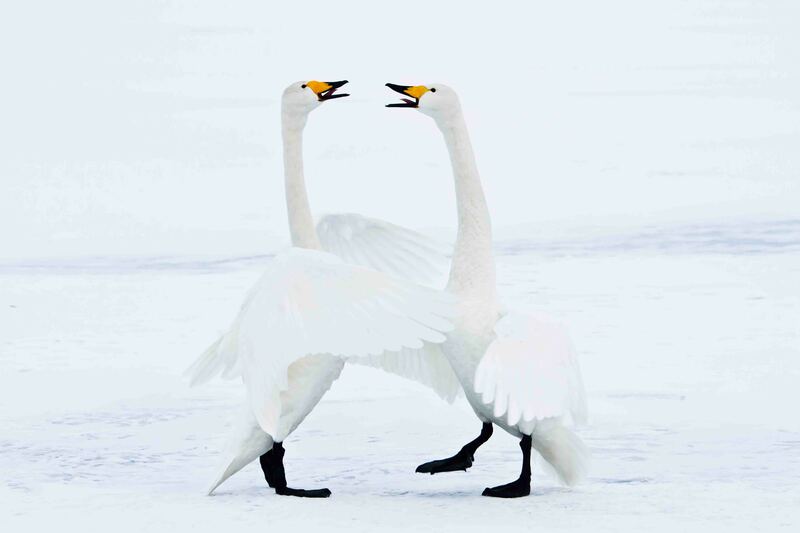 p/s: I love those swans ^ – ^ they do dance beautifully and happily ! Beautifully said, and we have a good start and I like & agree that we never really know about our 缘分 until the end of the relationship…with the best result being the relationship never ends. I like your way of thinking! Best of blogging to you too Yin-yin. Thanks so much for those very kind words of yours,Dalo! I do love your place,too, with many cool posts, amazing photos and nice thoughts ! Glad that we met ^ ^ ! Have a colorful weekend,Dalo ! I am ever so glad you found me in cyberspace, so I could trace back to your site! Have immensely enjoyed my visit here this morning and sooo looking forward to seeing your future work! Thank you very much, it is pretty amazing how I found your site and that wonderful poem. Just following one good thing leads to another. Our 缘分。 Have a wonderful weekend. Reading and viewing here certainly put me in top spirit, going forth into the weekend. I didn’t really think of my writing as poetry – but glad you saw it as such! “Ideas are what keeps us dancing.” Beautiful, expressive words. Dude. . .love your pix–absolutely fabulous images. Keep up the great work. Also, love your comments and overall attitude toward the places you visit and the act of travel itself. . .yes, yes, yes–travel helps the traveler and the people who interact with the traveler become more knowledgeable, compassionate, tolerant, cooperative, and understanding of ‘the other.’ Wish everyone could travel more. In the DPRK I see they are still doing the same gringo trail that I did there. . .fascinating. Love your thoughts on propaganda we receive regarding the North–especially when it comes to the DMZ experience. Love your Honey Boo-Boo comparisons and wonderful contrast of Kim vs. Kim–fun, fun, fun and totally spot-on! Interesting to read your take on the Children’s Performance Center–the smiles you saw as genuine and glowing I saw as fake and forced. . .felt like the children were indentured servants being forced to play the accordion–the accordion, really?–versus really having fun. I must have caught them on a bad day:-). And my take on the Kim Il Sung and Kim Jong Il pins in DPRK is that they are compulsory for all who want to ‘get along’ in the cultish system that you nicely summarize. Just like everyone in Washington has to wear the American flag pin or have their loyalty to the nation questioned–this really happens, amazing. All nations are different and the same. Endlessly fascinating and troubling and uplifting and hilarious, etc. . . Anyway, totally enjoy your work. . .look forward to seeing and reading more. David, great ‘post’ and thanks for the comments. Being open to the new culture & learning is the highlight of travel, and as you show in your blog – it is fascinating to see how cultural differences create biases that separate people, but when you get the opportunity to actually meet and interact with the population, life is pretty simple and enjoyable. I look forward to sharing more – and most importantly also follow along with others (e.g. via blogs and e-mail) about the travel experiences of others. The DPRK was an amazing trip, and I think you are correct on your take with the Children’s center and their smiles. While many of the smiles were “forced” there were also kids who were genuinely intrigued by something new (in this case, foreigners!). The watershed moments in the DPRK really occurred with the surprising genuine smiles on streets…totally unexpected and what is simply an electric connection that contains simple joy. Old, young, man, woman – when it happened it was moving. Very simple, beautiful and very human. Very true comments about Mao and Ho Chi Mihn, they won the battle…but their markets are succeeding mainly due to the freedoms they have allowed for their people (China has become the epitome of ‘wild capitalism’ that once dominated the USA…). Still a long ways to go, however for all such One Party systems (such a better description than the often used ‘Communist’ moniker). A wonderful response to my posts, very much appreciated. The comparison to the ‘Kim pins’ versus the ‘US Flag’ pins is spot on. There were minor upheavals when some US politicians went on camera without said pins that I had completely forgotten. Cheers, and safe travels! Your philosophy via photography definitely shines through, Randall. I absolutely love visiting your space here. And admit, I envy your travels. But I just love your artistic eye and soulful expressions. My travels have come about quite a bit through work…and being located in Hong Kong which allows so much access to numerous amazing cultures and places. While I actually dislike travel (I’d be thrilled to be living back in my small home town), meeting new people/cultures ignites much of my dreams/creativity. Thanks Noeleen, it is always great to hear from you…and to follow your great/heart-felt stories. I adore the subtleties in the definition that cannot be directly translated into another language. Or at least into English. What a beautiful first post. Me too, it is neat when I find one because it also gives me a little closer look inside the culture as well. Thanks Sofia. Yeah, its funny how a language can help shape a culture and way of thinking. Do speak German? (I don’t) Once a German friend said to me: How late is it? Apparently thats the literal translation from German to say What time is it? … geez, already implying that you’re late for something! Haha maybe I should. In Indonesian its also common to where are you going? when greeting someone. But even more amazingly is that when you have visitors and they are about to leave, it’s polite to ask if you want to eat more, do you need to take a nap or a shower. And it’s polite to “insist” about three times. I suppose nobody ever says yes I’m hungry, need a shower and a nap… but its just their basic politeness. Maybe it’s something from the past before there were cars and getting anywhere took too long, just want to make sure your guests are refreshed before their big journey?? In Indonesia, don’t worry, the proper reply is just to insist that no, no need… Haha unless ones boiler has broken down in the middle of winter like mine did last week, then one might say yes please! I knew you would smile…but I did not even ask: Do you like Nick Cave? Yes, ‘The Boatman’s Call’ is my favorite album of his, fantastic stuff. Not that syrupy I’m affraid!! 🙂 However…I’m happy as a child now! even Nick Cave sounds happy as I am happy…I can not say why…but you might try to guess! Thank you Nina, it great yuan-fen for us! Since I have made it all the way to the beginning of your blog, I just want to say it’s a true pleasure to peruse around in your posts. So full of human insight and not the least so many excellent photos that show the many different aspect of human life. Otto, what a great comment and feel sincerely happy to hear that you enjoyed both the photography and writing… You and your blog have been one of these great finds and pieces of inspiration that I had hoped to find. Wish you the best!